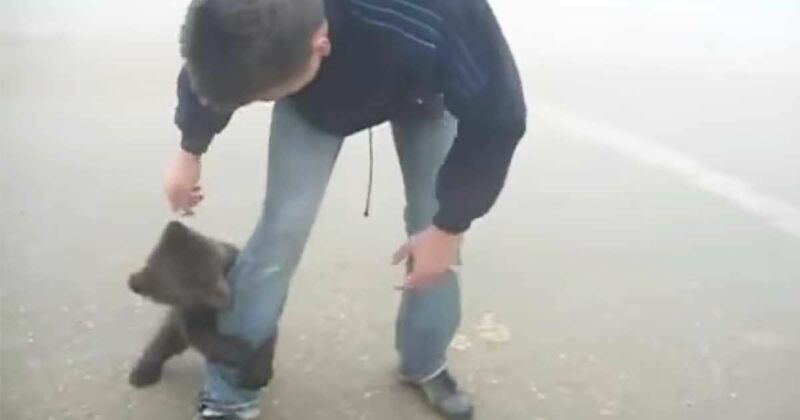 In the fun video below, an adorable baby bear cub, reportedly rescued from a Russian wildfire, was caught on camera engaging in a playful “attack” on one of his rescuers. The cub, which appears to be just a few months old, is as-of-yet incapable of doing any real damage, but he looks positively precious in giving it his best shot as he wrestles around with a young man all too happy to engage him in a lively battle. As Bears With Us explains, bear cubs are born in the winter, and by the age of 4-6 weeks, they typically weigh 2-3 pounds and already have a dense fur, nearly an inch long. They are already able to regulate their body temperature to some extent, but still call upon on their mother to keep them warm. On warmer winter days when the temperatures are in the 20s, the babies often enjoy sleeping on their mother’s back. By the time the cubs reach 8-10 weeks old, their fur will be over an inch long, and they will have begun walking around the den. In another month, they will weigh between 3-9 pounds. The cub’s weight at this point in their development is impacted by the mother’s weight and how many other cubs are competing for the mother’s milk. Litters are normally three or less. At this point in their development, the cubs are nearly ready to leave the den. As they toddle out of the den at around 3 months of age, well-developed cubs may already be able to climb trees, but they are not quick and agile, and still depend upon their mother to defend them from predators such as wolves or other bears. The mother will continue to nurse them, keep them warm, and will always return immediately to them upon hearing their cry. According to Dr. Lynn Rogers at the University of Minnesota, a mother will continue to care for their cubs until they are about 17 months old. At that point, she will chase them away as she prepares to mate and care for a new litter. A mother bear will recognize her cubs for many years, perhaps even the rest of her life. She will often allow them to remain in her territory, but will avoid the sections where they remain. In the below video, we only see a cub, but mother bear is likely not too far away. Take a look for yourself at the cutest bear attack ever, and SHARE if you love it!